The 31′ Hurricane 31D has 2 slides in the living room providing a large living area when fully extended. This unit is ideal if you are looking for more living space and don’t need a slide out in the bedroom. The unit has a dinette that folds into a bed, a couch with a pull-out sofa, and a rear queen bed. 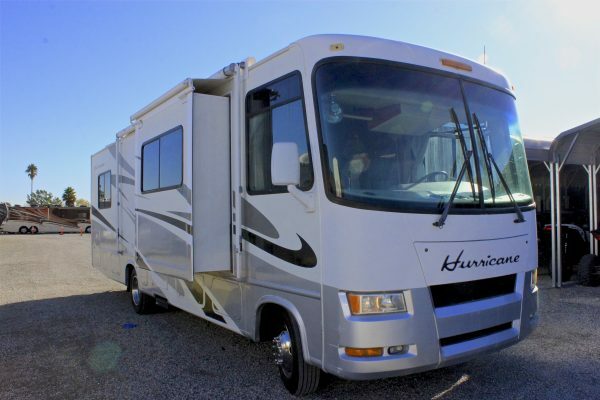 The 31D will sleep 5-6 in 3 beds: Bedroom, Pull-Out Sofa, & Dinette. This is a simple motorhome, easy to use compared to more advanced models. You will find a very large pass-through rear outdoor storage compartment, compared to similar non-basement style units. This unit has a very large full-with bathroom with a Neo-angle shower. The 31′ Four Winds Hurricane is equipped with 2 large living room slide out. Large Rear Bedroom with walk around bed. This motorhome has all the comforts of home. Large Living Area, Large Bedroom with Full bathroom and Kitchen.